I did not make the Zentai costume, this is commercially made, and I found it on eBay. 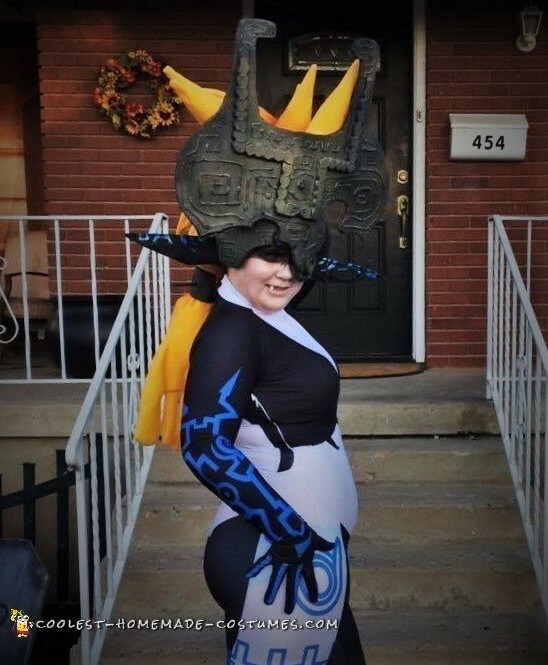 I made the Midna helmet costume, hair and ears. The helmet is made from a camping sleep pad from WalMart. They cost about $10. Its blue foam in a roll about 6 feet long and 3 feet wide that is in the camping section. I cut the pieces using scissors – two pieces. 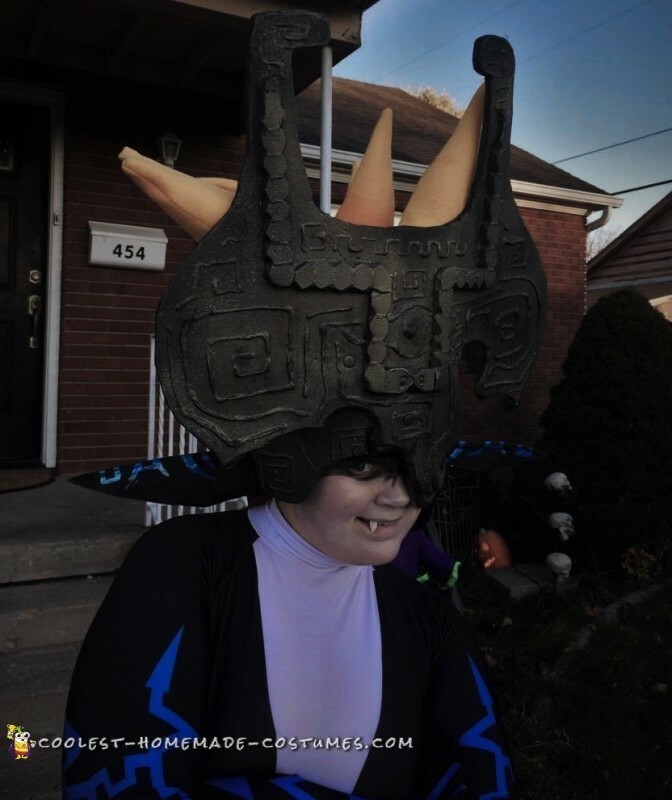 The circular helmet that goes around the head and the big, wide crown part that attaches to the front. You can get some realistic cracks using scissors that look like cracked stone, just work with it and learn how. Don’t attach the pieces yet. So, get some puff paints, it doesn’t matter what color, and add the details by drawing them onto the foam with the puff paint and let it dry. The eye is a circle of foam I cut out and shaped and glued on. The snake on front is the same thing- cut out shapes glued on. Fill all the gaps with glue. It looks funny until it is all painted so don’t worry if it looks bad, just focus on the shapes. Paint the pieces separately. It took me 4 cans of spray paint: matte black, brown “stone” texture, metallic gold, and a tan speckle stone texture paint. Put down a full black base and then go over it with the other colors in layers until you get a “stone” texture with a slight metallic sheen. Typically you go darker to lighter, but you have to go over it multiple times so just keep at it until it looks right. The front piece attaches the the helmet with large paper bracket things – the things we used to use in school to hold our reports together until they invented report covers. They are at the office supply store. AND glue. You will have to paint over the bracket heads once it’s attached, just work to match the rest. The ears are made out of a metal hanger and duct tape. The metal hanger is in a large upside down “U” shape with long perpendicular points on each end that are the ears. It goes over the head like a headband and is held on by the wearer’s bun and tension from the helmet. Then, I shaped the ears out of duct tape, spray painted them black, and hand painted the blue twilight design using metallic blue acrylic paint to match the zentai suit color. The hair is gold/yellow fleece fabric, cut into various sized triangles, sewn together to make the various sized cones and then one long “hand”. A little hit from a can or orange-red spray paints makes them look “firey.” They are filled with fiber fill stuffing found in the craft store. I glued the hand in first, and then started gluing the rest onto that and each other continually until the whole head was full of the hair cones. I was going to stuff some glow sticks in, but forgot to buy them for Halloween. 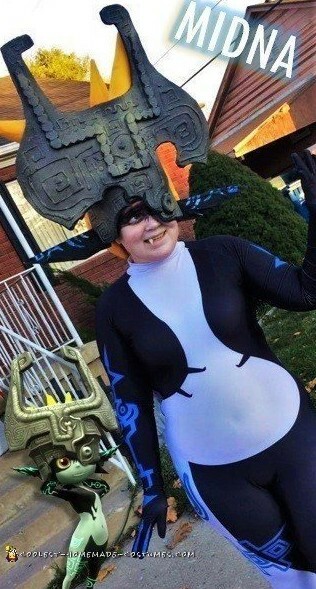 She plans to wear this to comic con, so we’ll try that then. Finally, use the remaining fiber fill to stuff it for a perfect fit. The stone thing in the hair – I guess its like a shackle on the hair-hand? – was made out of a strip of remaining foam, same paint details, and a wooden dowel. It weighs maybe 2.5 lbs. It isn’t super comfortable mainly because one eye is covered and you lose your binocular vision in it – but it isn’t heavy. Just big and hard to get through doors or into cars! 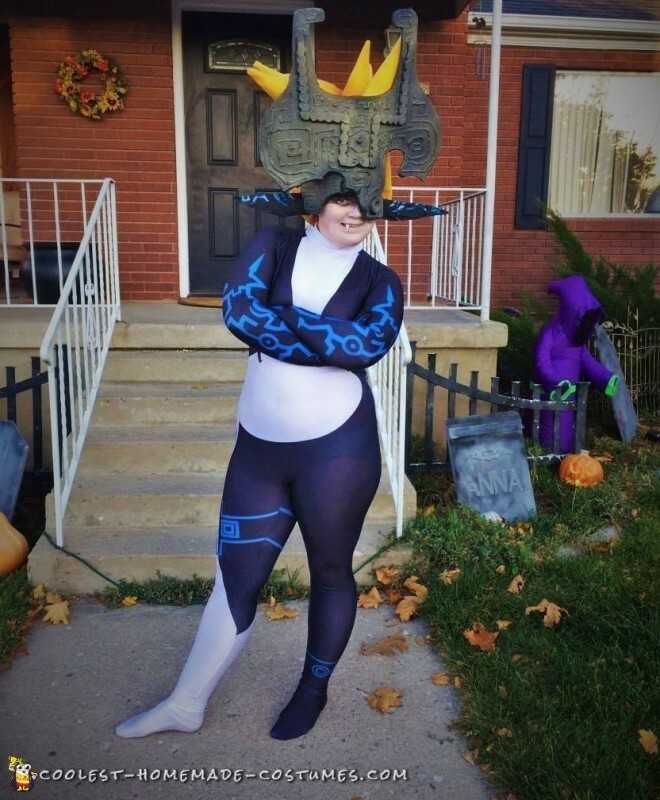 Everyone thinks this Midna helmet costume is amazing, but it isn’t super hard to make. If you take extra time to get the details right it could be WAY better using the same technique. I just rushed a lot of the puff paint and the snake details. I could have taken my time and really made it perfect. It took me 3 evenings after work. The majority of time is spent waiting for paint to dry.